Want to play flash games online but worried about the safety of Adobe Flash? You can significantly increase your computer's protection by playing the games in Google Chrome's "click-to-play" mode. Below I explain how to set this up. There's been a lot of discussion around the web about Flash's vulnerabilities. So it makes sense to limit your computer's exposure to Flash-based code. Click-to-play in Chrome is the method I personally use to play flash-based games online. 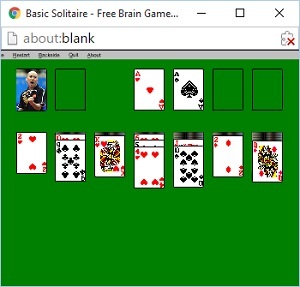 I have played the hundreds of free flash brain games on my website Memory-Improvement-Tips.com thousands of times. My computer has never been infected with Flash-based malware. In click-to-play mode, the Flash player plug-in is turned "off" by default. Flash content no longer loads automatically when you access a web page. Instead, you have the power to manually activate the Flash plug-in only when you need it, like when you want to play a flash game. With a right-click of the mouse (or Control-click on a Mac), you manually turn "on" the Flash plug-in just for that game page, so you can play the game. The Flash plug-in remains "off" in your other open Chrome browser tabs and pages, protecting you from Flash-based malware (if there is any) on those pages. If you navigate to another page on the same website, or to some other site on the web, the Flash plug-in is automatically "off" for those pages, too, unless you choose to activate it. It is possible to set up other browsers this way, but I'm going to explain how to set up Chrome only. In my opinion, and that of some computer experts, Chrome is possibly the most secure major browser for running Flash content (see below for a summary of reasons). And the Chrome click-to-play feature makes it super-convenient to control when the Flash plug-in runs. If you don't have Chrome, you can download it for free here. Chrome is available for phone or tablet (Android or iOS) and for desktop (Windows, Mac, or Linux). Click-to-play is one of the safest ways to play flash games online, because it limits your computer's exposure to Flash-based code to only those times when you need it. With click-to-play mode enabled, Flash content is blocked automatically as you surf the web. This gives you control and puts you in the driver's seat. 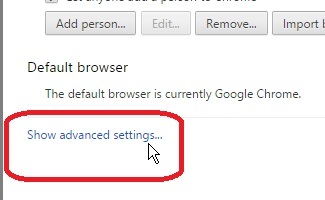 To set up click-to-play in Chrome, all you need to do is change the Plugins setting on Chrome's Content Settings page from "Detect" to "Let me choose when to run". If you don't already have the Chrome browser, download and install it. Open Chrome. Next, you need to open the Content Settings window. 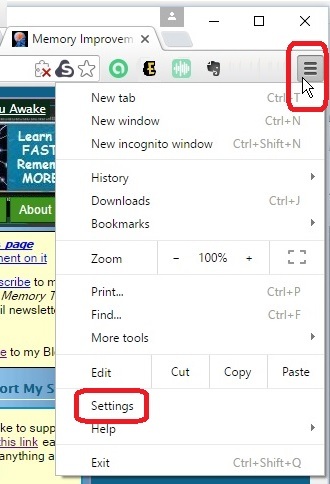 As a shortcut, you can open the Content Settings window immediately by copy/pasting or typing "chrome://settings/content" (without the quotes) in the Chrome address bar then pressing the Enter key. Then continue at step 5 below. Or, using the menus, first click the Customize button (looks like three horizontal lines) in the upper-right corner of Chrome. Click the Settings option in the menu that displays. The Settings screen displays. Click the "Show advanced settings" link on this screen. You may need to scroll down to see the link. Next, under the Privacy heading, click the "Content settings" button. Click the Done button to save the changes. Click-to-play mode is now active in your Chrome browser! 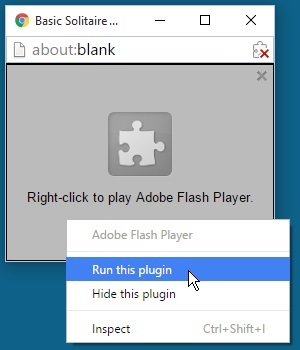 With click-to-play enabled, Flash content will be blocked automatically whenever you use Chrome. When you open a page that has a flash game, you'll have the choice to activate Flash for that game page only. Instead of seeing the game right away, a gray box displays with the message, "Right-click to play Adobe Flash Player." 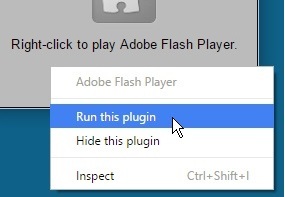 To play the flash game, right-click and choose "Run this plug-in" from the right-click menu (or Control-click on a Mac). The Flash plug-in then runs just in that page, and the game should load as normal. When you're finished playing the game, simply close the game window. The Flash player will still be "off" in all other Chrome tabs and windows. The convenient "click-to-play" setting isn't the only reason I prefer to use Google Chrome when playing online flash games. Chrome also has built-in features that help protect you against Flash-based malware. Chrome automatically sandboxes all Flash content behind a protective wall. This is an additional layer of protection against malware. Chrome patches its Flash player plug-in automatically every time you open the browser. That's means you're always running the most up-to-date version of the Flash plug-in, and you automatically have all the latest security updates. The less well-known Opera and Chromium browsers may provide these same protections, since they and Chrome are based on the same code. I don't know whether they support click-to-play, however. In the past, most people allowed the Flash plug-in to automatically run on every page as they surfed the web. Nowadays it makes more sense to have it turned "off" most of the time, and manually turn it "on" to run specific Flash content that you believe is likely to be secure. Adobe Flash has security vulnerabilities. That's why I recommend using a secure browser like Chrome with click-to-play mode enabled to turn Flash "off" except when you need it. Click-to-play in Chrome is probably one of the safest ways to use Flash content like online games. If you were to completely uninstall Flash, as some recommend, you'd no longer be able to play any online flash games or view any other flash content on the internet. For someone like me, who enjoys playing flash games, this isn't really an option. Rather than taking a drastic step like uninstalling Flash (which would break all the flash games on the web), you have the option to turn Flash "off" in your browser. Then, using click-to-play, activate the Flash plug-in only for the pages that need it, such as online games. Use your own judgment, but in my opinion that's a reasonable compromise. Important: No one can guarantee your computer will be 100% protected from viruses or other malware. So take reasonable steps to protect your computer system. At a minimum: install anti-virus, anti-malware, and firewall programs on your computers and other devices; make sure your browser is always up-to-date; and use your best judgment before visiting any website or opening email attachments.